Brock Lesnar will be returning to MMA training shortly but this time he will have a few cameras with him. Brock Lesnar and Junior Dos Santos will coach opposite one another on the next season of The Ultimate Fighter. The news ends any doubt about Brock Lesnar’s commitment to the UFC. The news came out of nowhere via UFC.com on Tuesday afternoon. 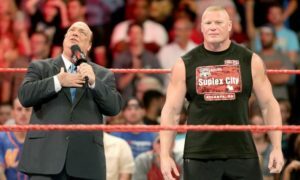 The news also ends the weeks of speculation about Brock Lesnar’s UFC future. It was rumored as recently as this week that Brock Lesnar and Dana White were at an impasse regarding Brock Lesnar’s next fight. The announcement also ends weeks of speculation about head coaches for season 13 of TUF. Junior Dos Santos is the number one contender to the UFC heavyweight title. Santos’s match against champion Cain Velasquez was recently canceled due to an injury Velasquez suffered in his title winning fight against Lesnar. Santos is taking a big gamble here signing for the season and a fight against Brock Lesnar while waiting for Velasquez. A loss would surely cost JDS his title shot. I am fairly surprised that Brock Lesnar agreed to do the show. Lesnar is a reclusive athlete who has turned down numerous Countdown specials due to privacy. I am also surprised the UFC would put Lesnar in this position. As a rather inexperienced MMA fighter the show has the potential to greatly expose Lesnar. Other than wrestling, what is Lesnar going to be able to teach these kids? I can’t imagine any kid on the show choosing to work with Lesnar over someone as well rounded as Santos. I wrote earlier this month that Brock Lesnar could leverage The Ultimate Fighter for an opportunity to return to the WWE and wrestle at WrestleMania 27. Lesnar has been reportedly offered $2 million to wrestle the Undertaker at WrestleMania 27. UFC president Dana White has Lesnar under contract and has repeatedly said he would not let his fighter wrestle. My guess is that White will allow Lesnar to wrestle at WrestleMania in exchange for coaching TUF 13. This isn’t confirmed but I think at the end of the day that is how it will play out. Vince McMahon couldn’t be happier because The Undertaker vs. Brock Lesnar is exactly what he needs to inject some life into WrestleMania 27. It is also interesting that they went with Santos here and not Frank Mir. Dana White had been reportedly after Frank Mir and Brock Lesnar to coach on The Ultimate Fighter 13. The fireworks and natural dislike between the two made the rivalry a natural for the television show. Additionally, Frank Mir seems like a much easier opponent for Brock Lesnar coming off a loss than JDS. No announcement was made regarding the UFC heavyweight championship. The only announcement of a fight was that of Brock Lesnar vs. Junior Dos Santos following The Ultimate Fighter 13. There was nothing mentioned regarding the fight being for a UFC interim heavyweight title. If Lesnar is going to wrestle at WrestleMania 27 in April my guess is that this fight will probably take place in July which seems to be Lesnar’s favorite month to fight in the UFC. Dave Meltzer reports that there are tentative plans to schedule the fight on June 11 which would be UFC 131. The fighters will be coaching an all welterweight class. The UFC and Spike TV do not have a contract for any future The Ultimate Fighter shows past this one. It was assumed that the delay in announcing coaches was that Dana White wanted some heavy hitters to drive ratings and earn the UFC a big renewal. Kudos to him because at the end of the day he got exactly what he wanted. In an interesting twist as of press time the story has since been pulled from UFC.com. Who’s your fighter? UFC 121 Walkout T-Shirts – Click Here!